New Place has 33 meeting rooms located in the Traditional Manor House or the Modern and contemporary Management Centre. You will also find 2 large private self-contained Meeting and events rooms located in the grounds of New Place. .
All our meeting rooms come equipped with 2 flipcharts, water cooler, jars of sweets, built in screens, whiteboards, projectors, phones, lectern, Complimentary Wi-Fi. 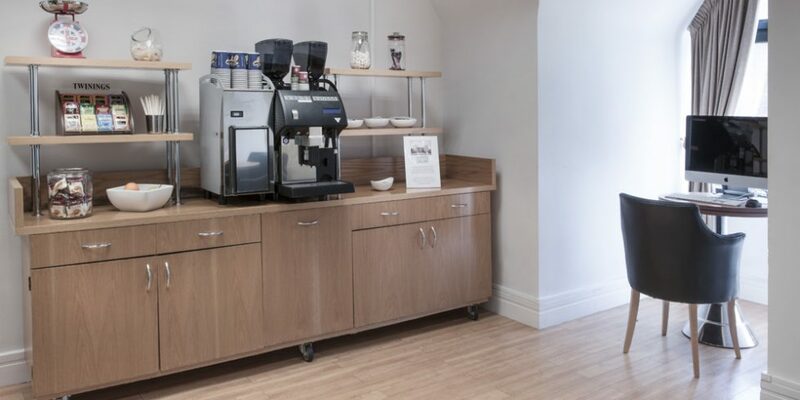 There are communal coffee lounges in both the Manor House and Management Centre which delegates can use freely and help themselves to coffee, cappuccinos, lattes, hot chocolate and a range of speciality teas. Fresh fruit is available all day with snacks of popcorn, pretzels and mini doughnuts at breakout times. For business needs there are PC’s, printers and photocopiers available to all delegates. There is a communal coffee lounge on the ground floor with comfy seating, 2 PC’s and a printer, photocopier with scanner, water cooler, coffee machines offering latte’s, cappuccinos’ hot chocolate and a selection of speciality teas. You will also find fresh fruit available all day and snacks of popcorn, pretzels and mini doughnuts at breakout times. Syndicate Rooms – We have 10 syndicate rooms in total at New Place based in both the management centre and Manor House. These rooms are perfect for your delegates to break away and work and small teams. They all have flipcharts and stationary and can hold around 6/8 delegates. Classrooms – All of the classrooms are based in the management centre on the ground floor. All have natural daylight, Air conditioning, a fixed screen and a projector. 2 flipcharts, stationary, a jar of sweets on each table, large whiteboard, lectern, water cooler and telephone. These rooms hold up to 60 theatre style and 20 cabaret. The Stratford room is a large conference room on the 1st floor of the management centre with its own private coffee lounge with PC, Coffee machine, water coolers, fresh fruit. The room also has 5 syndicate rooms attached to the main room which is perfect for delegates to use for private work. The Stratford room holds up to 80 theatre style and 40 cabaret. The Arden Suite is a building located in the grounds of New place which has direct access to a terrace with speakers, patio heaters and table and chairs. This room has its own separate coffee lounge and private Bar. The Arden suite can hold 130 theatre and 90 cabaret. The Court is a building located in the grounds of New place which has direct access to a terrace with speakers, patio heaters and table and chairs. The room has a large wide screen TV, and mezzanine coffee lounge. The Court can hold 56 delegates theatre style and 20 cabaret. These meeting rooms are located on the 1st Floor of the Manor House and all have large bay windows and overlook either the front of the hotel with its ornate iron gates or the terrace, gardens and cricket pitch. The Cressida and Ophelia rooms both have a syndicate room attached directly to them. These rooms hold up to 24 delegates cabaret and 25 theatre. These meeting rooms are located on the 2nd Floor of the Manor House and all have large bay windows with spectacular views or either our gardens and cricket pitch or, herb gardens, mews terrace and court terrace. Portia and Shylock rooms both have a syndicate room attached directly to them. Portia and Yorick hold 25 Theatre and 30 Cabaret, and Horatio and Shylock hold 16 Theatre and 12 cabaret.